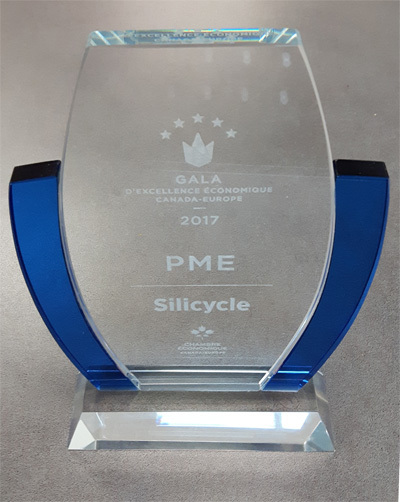 On Thursday, May 25, SiliCycle won the "SME" (companies with 500 or fewer employees) Grand Prize as part of the Canada-Europe Economic Chamber's Canada-wide competition. 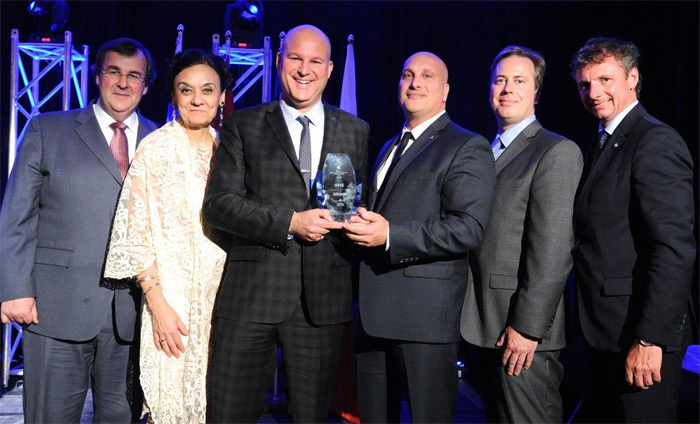 At the Canada-Europe Economic Excellence Gala, SiliCycle's President Hugo St-Laurent and Vice President Sales, Raif Kadri, received this award on behalf of all employees who contribute to SiliCycle's success in Europe. SiliCycle's candidacy stood out among the hundred other ones that were received. The fact that SiliCycle sells its products and services in 21 of the 28 countries of Europe was a decisive factor. The European market is a key factor in SiliCycle's development strategy as a Canadian company with a global business. SiliCycle has been operating in Europe since the early 2000s and has been intensifying its local efforts over the last five years, in particular through the creation of a logistics warehouse in Germany and the presence of resources in France (offices in Paris). The company develops its sales directly with customers, but also through a network of distributors covering almost the entire European territory. To date, the European market represents 25% of the company's results, with an average annual growth rate of around 30%. This is the positive result of a portfolio of high-performance and innovative products. Moreover, the SiliCycle brand is gaining notoriety, and the reputation of the Quebec society is growing every day. SiliCycle has sales in 21 of the 28 countries of Europe: Austria, Belgium, Croatia, Czech Republic, Denmark, Estonia, France, Hungary, Ireland, Italy, Latvia, Lithuania, Portugal, Slovakia, Slovenia, Spain, Sweden and the Slovak Republic, with an annual growth of 32% in 2016. The mission of the Canada-Europe Economic Chamber is to promote economic relations between the businesses located both in Canada and the European Union.